Accessia is a Google Maps based application that allows users to view and get directions to university campus buildings and events. The University of Murcia in Spain is the first campus to use the application but more Spanish universities are coming soon. The map includes a customised and fully detailed campus street map overlay on top of the base Google Maps tiles. 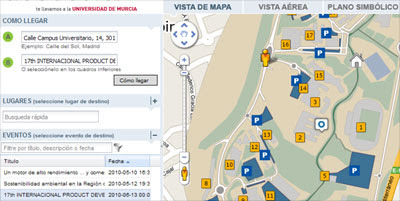 Users of the map can get directions to anywhere in the campus. The map includes options to view Street View, webcams and pictures. The map includes the option to find any campus buildings. From the side panel you can get directions, locate any building on the campus or find details about the locations of upcoming events to be held at the campus. Minube is a nicely designed Spanish language social travel community that enables users to plan trips and share their travel experiences. Minube allows you to browse the recommendations of other travellers and benefit from their experience. You can then plan your own personalised guide for your journey. including the places you want to see, the restaurants where you eat and the places you want to stay. The site even lets you compare flight and hotel prices. Minube uses Google Maps throughout the site to show the locations of recommended locations. SendaCLM is a route sharing site for the region of Castilla La Mancha in Spain. Users of the site can use Google Maps to create or find hiking or cycling routes. Users can include photographs and videos in their created routes. Users can add comments to routes created by others. The site has plans to add kml and GPS downloading of routes in the future. The Barcelona Research and Innovation Map is a Google Map of all research institutions, research centres, technological centres, scientific-technical facilities, research and technology parks in Barcelona and its metropolitan area. The map allows you to search its database by type of institution, by geographic area or by tags. All results are shown on the map and also listed by name. If you know of a research location that is missing you can add it to the map. Locamio is a free real estate listings site for Spain integrated with Google Maps. You can search for properties on the map by location and type of property. The site includes Street Views of properties. Locamio also has its own Google Earth Layer and its listings are published in Google Base.